Peter Le Cuirot grows award winning tomatoes, so who better to ask for a delicious recipe idea for enjoying tomatoes at their best? 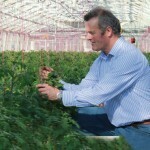 Peter says "We eat our tomatoes in lots of different ways, both raw and cooked. 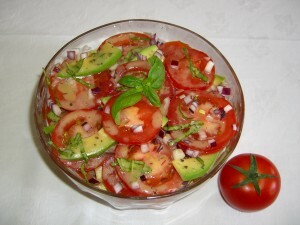 One of our favourite ways of serving tomatoes is in a simple tomato and avocado salad." All we do is layer sliced tomatoes with slices or small chunks of avocado, finely chopped red onion and roughly torn up sweet basil leaves and pour over a vinaigrette. The amounts and the type of vinaigrette can all be varied according to taste, as can the types of onion and herbs. We often use a balsamic dressing but spring onions and parsley go well with a french dressing. The dish can be enjoyed straight away or prepared a few hours in advance to allow the flavours to mingle, just make sure the avocado is covered with dressing or it will discolour. Thank you Peter, sounds like a perfect summer salad!